One of the easiest and most effective ways to stay healthy and lose weight is to have a well-balanced diet. It can be difficult to eat well, especially if you have no way to plan ahead for dinner. 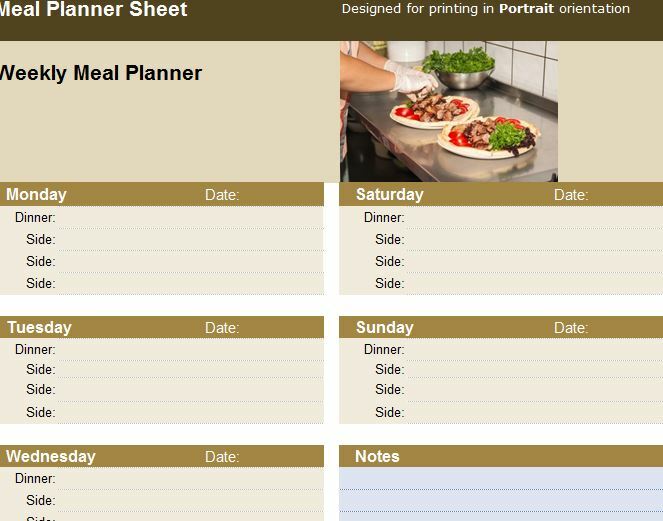 The Meal Planner Sheet is a way to help you organize your dinner plans for the week so you can always eat well. The urge to get fast food is the strongest when you’re starving and have no alternatives that can come quickly. This template helps prevent that by ensuring you have all the necessary ingredients prepped before you arrive home from a long day of work. Try the Meal Planner Sheet today to finally start achieving the health and nutrition you’ve always wanted. After downloading the template file directly to your computer, you can start to edit the document to fit your week. There are only two tabs for this template. The “Dinner Tab” is here you can enter your deliciously healthy meals and add hyperlinks to your favorite recipes/direction to cook them. There is even a section to enter sides for your dishes as well. Now, head over to the “Planner1” tab to actually start scheduling these meals for the week. There is a table for each day of the week and sub-sections to enter your dinner choice and the sides you want to include. Go through and enter the dates for each meal at the start of the week and list the dinner plate you want to have for those days in the areas below that category. If you scroll further down the page, you will find a notes section and a grocery list table to enter the ingredients you’ll need for this week. Once you have the items entered into your sheet, you can print the page and go to the grocery store for the items on your list. When you’re ready to cook, find your meal of the day in the “Dinner” tab and go the hyperlinked page to see how it’s made. Start eating healthy with the Meal Planner today!